from Ottolenghi: The Cookbook, pp. 114-15. Traveling to other people’s holiday meals can be one of the drawbacks of living alone, especially now that traffic in northern California grows worse every year. For a long time now, I’ve been giving some thought to instituting my own traditions in my own home. For instance, I would like to establish a custom of throwing an annual open-house over the holiday break, but that’s unlikely to begin this year. Instead, I plan on cooking a nice, festive meal on Christmas day at home. Like a lot of people, I don’t crave the usual foods cooked at Thanksgiving. I’d rather do something different. So, two days after Thanksgiving, I decided to try Ottolenghi’s Roast Pork Belly, which Ann made while I was in London. That first attempt — and a second one of hers that reinforced in us both the pitfalls of the recipe — made it clear that he set the roasting temperature far too high. It’s difficult to imagine an oven or kitchen in which one could roast a pork belly at 500 degrees for an hour. You’d certainly get crackling, but you’d also get a smoky kitchen and a charred baking dish, which is what we wound up with in the London kitchen. A recipe like this also makes me envy the British once again for the butcher’s cuts commonly available. A pork belly in the UK comes with thicker skin than I can find on the cuts here. A soft, leathery skin makes for great crackling. 1. Heat the oven to 250 C [500 F] or its highest setting. Place the herbs, garlic and olive oil in a heavy-duty blender or food processor and purée them roughly. 2. Lay the pork belly in an oven tray, skin-side down, and sprinkle lightly with salt and pepper. Use your hands to spread the herb mixture evenly all over the top, pressing it on so it sticks to the meat. 3. Turn the belly skin-side up, wipe the skin dry with kitchen paper and sprinkle sea salt evenly all over the skin (but don’t put too much on, as it might create a crust and prevent the crackling forming). Put the tray in the oven and roast for 1 hour, turning the tray around every 20 minutes. Once the skin has formed some crackling, turn the oven down to 170 C [325 F], pour the white wine into the tray (avoiding the pork skin) and continue roasting for another hour. If the belly starts turning black, cover it with foil. 4. For the last cooking stage, turn the oven down to 110 C [225 F] and continue roasting for another hour, until the skin has crackled completely and thoroughly dried. 1. Heat the oven to 150 C. [325 F]. Place the plums and chilli in a heavy-based saucepan and add the cinnamon, star anise, vinegar and half the sugar. Stir well, bring to a light boil and simmer for 20-25 minutes, stirring occasionally and skimming any froth from the surface if necessary. The plum should have a jam-like consistency. To check this, chill a saucer, put a teaspoonful of the chutney on it, then run your finger through it; it should stay separated. Remove from the heat and leave to cool. 2. While the plums are simmering away, place the rhubarb, ginger and remaining sugar in an ovenproof dish. Rub them together with your hands and place in the oven. Cook for 20-30 minutes, stirring from time to time, until the rhubarb is tender. Remove from the oven and leave to cool. 3. Combine th eplums and rhubarb and mix well, remove the chilli, then transfer to a jar and leave to cool. Either serve the relish straight away with the pork or store in the fridge, where it will keep for a week or two. I should start with the relish, actually, since I made it a week ago. That it worked so well with the pork belly in the end is a testament to its versatility, because rhubarb has disappeared from the stores. I increased the amount of plums, used only 2/3s of the sugar. It keeps very well in the fridge as long as it’s tightly sealed in a jar. I bought a 2 lb slab of frozen pork belly, which the butcher sawed in two and rewrapped it. For my own meal, I used one of the two slabs. The directions in step 1, 2, and most of step 3 are straightforward. I placed the pork belly, slathered on one side with garlic and herbs, in a pyrex deep pie dish. But instead of setting the temperature at 500, I preheated it to 450. After putting the pork belly in the oven, I reduced the temperature to 350 and set my timer for 20 minutes. When the bell rang, I turned the dish part way round and set the timer again for another 20 minutes and then another 20 minutes. Meanwhile, before the first hour was up, I poured 2 cups of white wine and added whatever was left of the garlic-herb-oil mixture into a saucepan and let it come to a soft simmer. It makes no sense to me to add room temperature — or worse, cold — white wine to a hot oven. It would just reduce the heat. 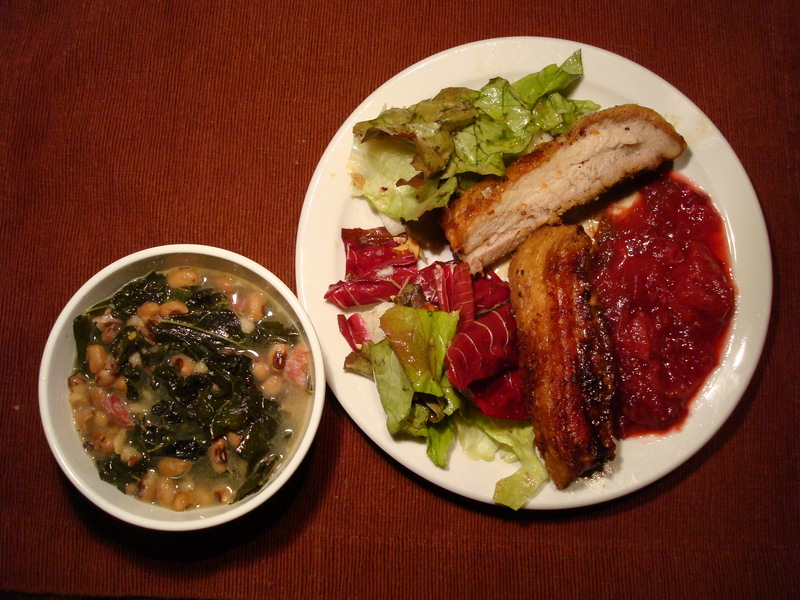 When the first hour was up, I poured some of the simmering wine around but not over the pork belly. I want what little skin left on it to crisp up, which it won’t do if it’s soggy. Over the remaining two hours, I added more wine when it looked as though the liquid threatened to evaporate completely. I did not lower the oven temperature again, as Ottolenghi calls for. The pork belly did just fine. After three hours, I removed it from the oven, let it rest about 10 minutes and then carved it into four thick slices, two of which went on a plate with some relish and a small lettuce salad lightly dressed with a lemon-shallot vinaigrette. The flavors of the relish melded beautifully with the pork belly. The acidity of the vinaigrette sliced through the sweetness of the fat. I think I’ll try roasting it at 375 next time. Now that I’ve posted three recipes for pork belly, I suspect that if I prepare the pork belly according to Ottolenghi’s directions and follow Fergus Henderson’s roasting method, I’ll get the best of both. That is something I very much look forward to. Sorry, Anne Marie, but I bet it will still be good. In a few days, I’m going to repeat Fergus Henderson’s pork belly, which I posted a long time ago here. Next time, try that one. I made the relish last night (I am slightly obsesse with rhubarb at the moment) and loved it. I didn’t bother roasting the rhubarb separately, nor indeed measuring any of the ingredients – just threw the whole lot in a pan, brought it to the boil and simmered for about 45 mins. LOVE it! Filled a jar with the leftovers and just had some with cheese for lunch – it’s perfect. optimal Costs to return to star in “Stealth”. Jason Walsh, her personal trainer recently revealed to People Magazine the workout that gives you a fan of Jessica Biel? So what are wicking pajamas? For having an overly acidic body. Isn’t it? Ottolenghi’s most recent book is worth buying. I love it. Hi there, I’ve just stumbled upon your article. I’ve cooked the Ottolenghi pork belly several times but what I’m never clear on is whether the pork belly should have bones in or not? Do you do yours with the bones in or out? Thanks!